To study this, I formed The Physician Collaboration Project and quickly learned that the limitations of technology, the access to information, and the misalignment of incentives were the three key reasons for managed care’s inability to control costs. Even the fact that the general health of Americans was deteriorating could be traced back, in part, to the disintermediation of the physician relationship with his or her patient. It was evident that self-insured employers, health plans, third party administrators, and carriers needed to collaborate directly and strategically with physicians and their supporting provider ecosystems if they really wanted to reduce healthcare costs. And someone needed to write the code that would make that possible. Having built my career in the traditional managed care environment at a global health insurance company, I could not understand why the system was so focused on the fees physicians charged rather than on the care they authorized. ‍Support physicians anywhere in the U.S. In spite of the efforts of many constituents in the healthcare vertical, the expense of medical delivery in the U.S. has continued to rise. 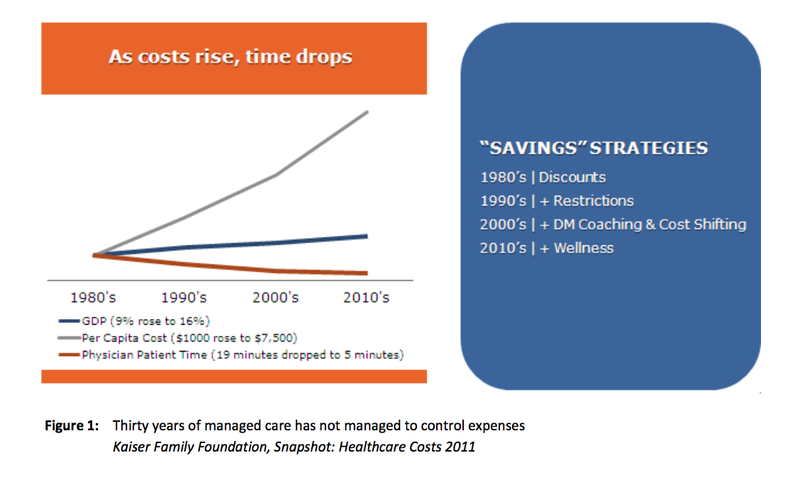 As can be seen in the table below from the Kaiser Family Foundation in 2011, the costs have risen dramatically over the last 30 years. Also shown is the amount of time, on average, that patients are now spending with their physicians compared to 30 years ago (73% reduction). While we began with no bias as to problems or solutions, we came to believe that physicians' increasing disintermediation as the leading influencer of value in the healthcare industry was a root cause. Because of denegation of market strength and related reductions in fee schedules, the unfortunate result is that utilization and costs continue to escalate and patients are receiving less attention. Plan sponsors are paying more… and getting less. The conclusion of The Physician Collaboration Project was that this misalignment of goals became the root cause of waste. When each party acted independently, without the valuable information needed to improve outcomes at lower costs the connection between cost and health value was broken with no way to bridge the gap. Essentially, the entire industry deteriorated to a focus on price, because its only successful attempt to focus on true cost containment came with onerous restrictions on patients, another version of “the stick” approach managed care companies took with physicians. Correcting that misdirection was the beginning of revelationMD.